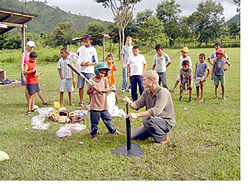 A volunteer teaches tee-ball in Honduras. Service learning is a method of teaching, learning, and reflecting that combines an academic classroom curriculum with meaningful service, frequently youth service, in the community. As a teaching methodology, it falls under the category of experiential education. More specifically, it integrates meaningful community service with instruction and reflection to enrich the learning experience, teach civic responsibility, encourage lifelong civic engagement, and strengthen communities for the common good. In 1914, the Smith-Lever Act provided funds for cooperative administration of agricultural extension education by the United State Department of Agriculture and the state land grant colleges with the twin purposes of increasing farm productivity and improving rural life. As the productivity of the farms increased, the economy was built up thus helping the communities. From the 1870s until the 1930s, the Chautauqua Movement in the United States proposed that secular as well as religious instruction be included in the (Methodist Episcopal) summer Sunday-school institute. 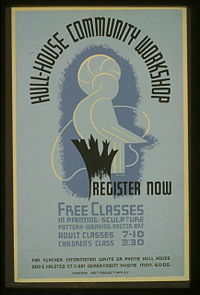 This program, started in 1874, evolved into an eight-week summer program offering adult courses in the arts, sciences, and humanities, and was attended by thousands each year. Home study groups and local reading circles also sprouted and flourished around the country. In 1903, John Dewey developed the intellectual foundations of service learning. "Thought and its Subject-Matter," was published along with a number of other essays by Dewey's colleagues and students at Chicago under the title, Studies in Logical Theory (1903). These ideas were able to be applied directly in a laboratory school at Chicago. The Cooperative Education Movement was founded in 1906 at the University of Cincinnati. It was an organized program designed to expand the students' academic learning beyond the traditional classroom and laboratory setting. By 1942, there were 30 successful programs in existence in spite of the severe depression of the 1930s, During the war years this growth was halted because most co-op programs were discontinued in favor of the emergency acceleration of academic programs. After World War II, the second growth period in the cooperative education movement sprung up and continued growing to nearly 200 colleges and universities by 1970. 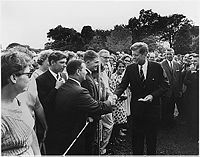 In 1961, President John F. Kennedy established the Peace Corps for the purpose of promoting world peace and friendship. Young men and women qualified for service abroad and willing to serve help the peoples of the world by meeting their basic needs and to help promote a better understanding between the American people and the peoples served. President Lyndon B. Johnson declared a "war on poverty" and signed the Economic Opportunity Act of 1964. This act created Volunteers In Service To America (VISTA). By the end of 1965, more than 2,000 members were working in the Appalachian region, migrant worker camps in California, and poor neighborhoods in Hartford, Connecticut. Since 1965, as of 2006, more than 140,000 Americans served through VISTA. One of the first formal attempts at defining the engagement between schools and community occurred when the Southern Regional Education Board (1969 - (sponsors included Southern Regional Education Board, U.S. Dept. HEW, City of Atlanta, Atlanta Urban Corps, Peace Corps, and VISTA) defined Service Learning as the integration of the accomplishment of the tasks that meet human needs with conscious educational growth. In 1971, the National Center for Public Service Internships and the Society for Field Experience Education were established. These two organizations merged in 1978 to become The National Society for Experiential Education (NSEE), a nonprofit membership association of educators, businesses, and community leaders. NSEE has a national resource center for the development and improvement of experiential education programs nationwide. It supports the use of learning through experience for intellectual development, cross-cultural and global awareness, civic and social responsibility, ethical development, career exploration, and personal growth. Another revival of service learning as a tool for educational reform began in the 1980s, starting mainly with colleges and universities and working its way into high schools. The 1990s have seen the emerging shift to younger and younger students in middle and elementary schools as well as for students with disabilities. In 1992, Maryland became the first state in the nation to require high school students to engage in service learning activities as a condition of graduation. Congress passed the King Holiday and Service Act of 1994, transforming the Martin Luther King Holiday into a national day of service so citizens have the opportunity to live Dr. King's legacy through volunteerism. This legacy is best described in Martin Luther King's own words, "Everybody can be great because anybody can serve." an opportunity to give back to their communities through their own service. President George W. Bush created the President’s Council on Service and Civic Participation in 2003 to find ways to recognize the valuable contributions volunteers are making in the United States. The council created the President’s Volunteer Service Award program as a way to thank and honor Americans who, by their demonstrated commitment and example, inspire others to engage in volunteer service. Curricular connections - Integrating learning into a service project is key to successful service learning. Academic ties should be clear and build upon existing disciplinary skills. Student voice - Beyond being actively engaged in the project itself, students have the opportunity to select, design, implement, and evaluate their service activity, encouraging relevancy and sustained interest. In community settings, this is alternatively called youth voice. Reflection - Structured opportunities are created to think, talk, and write about the service experience. The balance of reflection and action allows a student to be constantly aware of the impact of their work. Community partnerships - Partnerships with community agencies are used to identify genuine needs, provide mentorship, and contribute assets towards completing a project. In a successful partnership, both sides will give to and benefit from the project. In order for this partnership to be successful, clear guides must be implemented as to how often a student engages in service to a particular community agency. Authentic community needs – Local community members or service recipients are involved in determining the significance and depth of the service activities involved. Assessment - Well structured assessment instruments with constructive feedback through reflection provide valuable information regarding the positive 'reciprocal learning' and serving outcomes for sustainability and replication. The key point that differentiates service learning from community service is the intentional learning experience. For example, if students clear garbage from a stream, they are providing a valuable service to the community. However, if those same students clear the stream, analyze and discuss what they found, identify possible sources, share the results with local residents, and suggest steps for reducing pollution, they are engaging in service learning. In addition to providing a valuable community service, they are developing an understanding of pollution issues and learning to explain those issues to the public. They may also be encouraged to reflect on their personal and career interests in science, the environment, public policy or other related areas. In this way, service learning combines service with learning in intentional ways. The service learning method ties in well with a teaching philosophy known as constructivism. Constructivism is an educational theory rooted in psychology and sociology. It asserts that learners construct knowledge from previous knowledge rather than passively absorbing knowledge from outside sources. Furthermore, learning includes both creation of new factual knowledge and understanding the connections between different nodes of knowledge. Service learning provides an environment where students can actively construct knowledge while engaging in actual projects. The reflection portion of service learning gives students time to create connections between old and new knowledge. While accepted by many, some educators have criticized constructivism both epistemologically and pedagogically. Pedagogically, critics claim that a constructivist approach gives students in-depth knowledge but not breadth of knowledge. Since a constructivist approach takes a significant amount of time to allow students to create new knowledge and relate it to previous knowledge through reflection, instructors usually cannot cover a large amount of material. However, while this may become a real concern for many courses, the specific role of service learning plays in engineering school courses mitigates these concerns. Service learning typically appears in introductory or optional courses in the engineering school. The goals of these courses is not so much to gain a detailed and broad understanding of a field, but rather to have a real world engineering experience. This is notably different from courses where students must obtain vast amounts of accurate knowledge for precise calculations. Critics also worry that a constructivist approach to education leaves the learner too disconnected from reality since it constantly focuses on building new knowledge based on pre-existing knowledge. Thus, theoretically, as they continue building knowledge from their pre-existing knowledge in isolation, their view of the world could slowly become skewed from reality. While this may be a weakness for many courses, in service learning, students work to create real solutions for a real customer. Thus, this mitigates the weakness of the pure constructivist approach since their ideas must be resolved, not only with fellow engineering team members, but also with reality. Research shows that effective service learning experiences foster the values and behaviors that are the goal of character education. For instance, studies show that students who take part in service learning strengthen not only their academic skills, but also civic attitudes and citizenship skills. In addition, there is evidence that service learning provides the key experiences that lead to resiliency and helps develop a sense of social responsibility. Service learning helps develop students' sense of civic and social responsibility, as well as their citizenship skills. Teachers and students have greater respect for one another. Students are less likely to engage in risky behaviors. Service learning has a positive effect on students' interpersonal development and the ability to relate to culturally diverse groups. Service learning provides an avenue for students to become active, positive contributors to society. In addition to academic content, service learning can facilitate a range of valuable practical skills including: problem solving, organizing, collaborating, project management, and research as well as dealing with obstacles and setbacks. It develops character virtues and interpersonal habits such as respect, responsibility, empathy, cooperation, citizenship, initiative, and persistence. One of the most valuable aspects of service learning is that it empowers students with the realization that they can make a difference. Anyone can actively participate and make a meaningful contribution regardless of their talents and skills or lack thereof. Although service learning is a requirement in many educational jurisdictions, the academic value of the service learning is based on the purposeful connection of service to stated learning goals. First of all, service learning should not be assigned. It is vital that the participants are engaged in not only the activity but the deliberating, planning, implementing, and reflecting on their service. While the requirement for service learning is provided for the benefit of both the student and the community, some students find it difficult to complete. This is especially the case if they have enrolled in a number of advanced courses which require a large amount of homework. There are few resources to assist faculty in constructing a service learning syllabus. Service learning syllabi number in the hundreds but the standards vary dramatically. To be effective, high-quality is essential in service-learning practice and effective standards must be adhered to. There are many opportunities to experience service learning by traveling to countries around the world and experiencing the excitement of sightseeing as well as experiencing the challenges of the area first hand. It can be a life changing opportunity to serve with projects at a remote mission station, a medical clinic, an orphanage, or a refugee camp. Experiencing a volcano island, a jungle river, a rainforest, a cloud forest, and/or a world class beach while getting to know the world’s people, art, music, culture, and religions can be invaluable. At the same time, parents of young people need to be sure the program has enough supervision and an appropriate standard of safety and behavior. The National Youth Leadership Council has, for more than two decades, led a movement linking youths, educators, and communities to redefine the roles of young people in society. Their vision is a more just, sustainable, and peaceful world with young people, their schools, and their communities to be achieved through service learning. The National Service Learning Clearinghouse (NSLC)- provides the world's largest database of Service Learning materials, electronic resources, and job listings. National Service Learning Partnership- a national network of members dedicated to advancing service learning as a core part of every young person's education. The Partnership concentrates on strengthening the impact of service learning on young people's learning and development, especially their academic and civic preparation. The Jimmy and Rosalynn Carter Partnership Foundation fosters academic service learning in higher education with awards and grants to students/faculty and their 501(c)(3) community partners who demonstrate best practices or innovative approaches in the field. The Carter Academic Service Entrepreneur grant program seeks to motivate students to develop innovative service-learning projects by providing $1,000 grants to the community organization partner of the student with the most innovative proposal in a state-wide or school-wide competition. ServiceBook, sponsored and maintained by JRCPF, is the online community for academic service learning. The Leadership, Ethics, and Social Action Minor- At Indiana University-Bloomington the LESA program focuses on civic participation, community decision-making, and citizenship skills: how to communicate and organize and lead while serving as a citizen. Pre-professional students who wish to be involved in a community setting are attracted to the program. Pre-law and pre-med, as well as pre-business, students find opportunities to develop their professional presentation. Facing the Future develops young people’s capacity and commitment to create thriving, sustainable, and peaceful local and global communities. They do this by equipping teachers and schools with the curriculum and workshops used as strategies to help students, and maintaining an online database of service-learning projects of international and local interest. Serve Canada engages diverse youth in experience-based education, teamwork and community involvement so they may establish personal direction, overcome obstacles, achieve goals, and contribute to society. The International Partnership for Service Learning and Leadership offers programs uniting academic study and volunteer service to the community in international/intercultural settings that are models for the practice of service learning, and promotes the theory and practice of service learning through research, publications conferences, and training. Service for Peace brings diverse groups together in service in order to cross barriers of race, religion, class, creed, or national origin, and address urgent social needs. Service For Peace provides service and learning opportunities through community projects which promote transformational and sustainable personal and community development around the world. The organization brings together people and partners of diverse faiths, ethnicities, nationalities, generations, and cultures to address profound social needs by discovering commonality and genuine appreciation for differences – all through service. The underlying principle is that peace begins with the inner peace fostered by service to others and that active cooperation provides the foundation and the real hope for peace. ↑ Backgrounder on the Morrill act,, Retrieved November 7, 2007. ↑ 11.0 11.1 J. Mariappan, S. Monemi and U. Fan, Enhancing Authentic Learning Experiences through Community-based Engineering Service Learning. 2005. ↑ J. D. Bransford and B. S. Stein. The Ideal Problem Solver. (New York: Bice-Heath, 1993. ISBN-10: 0716722054). ↑ R. K. Coll and T. G. N. Taylor, "Using Constructivism to Inform, Tertiary Chemistry Pedagogy." Chemistry Education: Research and Practice in Europe, vol. 2, pp. 215–226, 2001. ↑ K-12 Service-Learning Standards for Quality Practice, National Youth Leadership Council, 2009. Retrieved May 7, 2009. Billig, Shelley. 2000. Service-Learning Impacts on Youth, Schools and Communities: Research on K-12 School-Based Service-Learning, 1990-1999. Denver, CO: RMC Research Corporation. Corporation for National and Community Service 1990 - as adapted from the National and Community Service Act of 1990  Retrieved November 7, 2007. This page was last modified on 8 September 2015, at 19:36.